A year ago, I wrote an article about the Dumb Grid, complaining that the reason that many utilities find wind power so hard to integrate is because they aren’t using any brains. I used the infamous Feb 2008 incident when wind power in Texas dropped right as demand picked up because of a cold front to make my case: Both the rise in demand and the drop in wind power were predictable consequences of the cold front, but the ERCOT controllers were not using that weather information in their dispatch planning. Hence, the problem was not wind power or even the cold front: it was failure to use the available information. ERCOT has begun using forecasting tools from AWS Truewind to help it manage wind energy resources. In the coming days ERCOT will begin using a ramping tool, from the same vendor, to improve its forecasting of wind resource ramping events. Just a week before our visit, the AWS Truewind software–operating in a test mode–predicted a 2,000 MW drop in wind resource followed 15 minutes later by a 2,000MW recovery. The predicted ramp event matched the actual event almost perfectly. Joel Mickey told me that ERCOT is happy to dispatch as much wind energy as is available. Thanks to Micheal Giberson over at Knowledge Problem for bringing this article to my attention. A new National Renewable Energy Laboratory (NREL) study, taller wind turbines can produce more power. This is no surprise to anyone. Trees and other objects on the ground slow the wind, and as you get higher, you enter the region of smooth laminar flow where more energy is available. Laminar flow starts at about 50m. What is interesting is that we may need to revise all our assumptions about how much wind is available for electric power. In Colorado, NREL found 3x as much wind potential at 80m than a previous Colorado study using the 50m hub height assumption. After all, not only is there more swept in the laminar flow, but there are more areas where tall wind turbines would have the 30% minimum capacity factor NREL assumes is enough to make them economic. Here’s a graph showing the increase in capacity factors going from 80m to 100m hub height. I never thought it was going to become a movement! Delta-Montrose was first. Who’s next? Holy Cross, maybe? I received serious skepticism to my idea that wind turbines could significantly slow the wind speed on the Great Plains. One of the criticisms came from an atmospheric scientist I asked to weigh in on the matter. The problem is, I did not find either of their arguments convincing, although I concede Daniel knows more about it than I do. In responding to them, I came up with an approach for calculating the total power of the wind in the Great Plains. Wind is caused by differences in temperature and pressure as a result of uneven solar heating. Hence the total energy of the wind is a small fraction of the total solar flux. I’m guessing that the amount of solar flux that is actually converted into wind energy is below 1%, probably far below that, but I’ll use 1% until someone gives me a better number. The Great Plains is 1.4 millions square miles in area, including parts in Canada and Mexico. The average solar flux is about 4 MWh/day/m2 (using numbers for Des Moines, IA.) There are 2.6 million square meters per square mile, making the total solar flux on the Great Plains about 14 trillion MWh/day. Using my 1% conversion efficiency into wind, and 24h in a day, we get total average wind power on the great Plains of 6,000 million MW. That energy is currently absorbed by objects on the ground and internal frictional losses in the air. To create significant wind speed drops, a significant fraction of that 6,000 million MW would have to be absorbed by wind turbines. In my previous article, I used another approach to calculate that 1 million MW of wind turbines would be enough to significantly slow the wind on the Great Plains. Hence, unless my 1% solar-to-wind conversion efficiency is too high by three orders of magnitude, it looks like the skeptics were right. I recently had the somewhat questionable pleasure of driving across most of the Great Plains. It has been over a decade since I last did a long distance drive across the Plains, and a new feature is starting to pop up: Wind turbines. Sometimes in ones and twos, sometimes by the tens or hundreds. I may be biased, but I find modern wind turbines to be among the most beautiful built structures in the world. They have a slow, graceful motion that belies their Brobdingnagian scale. They were particularly beautiful on a foggy evening driving as I drove through a wind farm near dusk, when I could see only the bottom half of the giant blades as they swept gracefully down out of the mist in a slow motion appearing and disappearing act. reduce wind velocity, which had occasioned severe soil erosion across the Midwest and dust storms to the eastern seaboard. In some ways, the Shelterbelt project can be seen as an early experiment in geoengineering. I sincerely hope that any future projects are so successful and benign. Wind turbines, too, reduce wind velocity. After all, a wind turbine’s function is to take wind energy, and convert it to electricity. This led me to wonder just how many turbines would it take on the Great Plains to significantly lower the average wind speed in the region? According to FTExploring, a wind turbine can extract about 35% of the wind energy passing through the swept area of its blades. 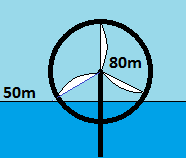 A typical 2.5 MW wind turbine from General Electric (GE) has a rotor diameter of 100m. To get a ball-park figure, imagine two rows of GE 2.5MW turbines were installed from north to south along the Shelterbelt project (1200 miles) with rotor blade tips inches apart. If the two lines were offset, wind blowing from east to west or west to east would have to pass through one or two rotors, losing 35% to 58% of its energy along the way, and exiting the back of the turbines 15% to 25% slower. Such a double row of turbines would require about 386,000 turbines, or about 1 million MW of wind. So, according to this back-of-the-envelope calculation, 1 million MW of wind installed in the Great Plains (even if not installed in a north-south line) should be enough to noticeably decrease the overall wind speeds in the region, and not only reduce soil loss from wind, but also reduce the cost effectiveness of installing more turbines. Assuming a 35% capacity factor, this equates to about 3,066 million MWh. In 2008, the US produced 4,119 million MWh of electricity, so 1 million MW of wind represents about a 75% of electricity production from wind in the Great Plains. Even if there were sufficient transmission to distribute the power across the country, and geographic diversity greatly moderated the the overall variability of wind, such high penetrations would be impossible without prohibitive investments in electricity storage. With current storage technology, a greatly enhanced national grid, and a full roll out of smart grid technology used to better match demand to supply, I would guess that the upper limit for wind penetration would still be only 50% (and considerably lower if any of these things fail to materialize, especially the diversifying benefits of a robust national grid.) This upper limit (and the fact that only a fraction of wind power is likely to be generated on the Great Plains) means that we’re probably unlikely to need to cut down any trees on the Great Plains in the hope of increasing the wind output of out turbines. The United States had a cumulative 35,000 MW of wind installed by the end of 2009 (about 3.6% national penetration using the numbers above) so we’re still a long way from slowing the wind significantly on the Great Plains, or anywhere else. I wonder if farmers who lease some of their land to wind farms notice any local slowing of the wind? Is that a positive externality worth accounting for? 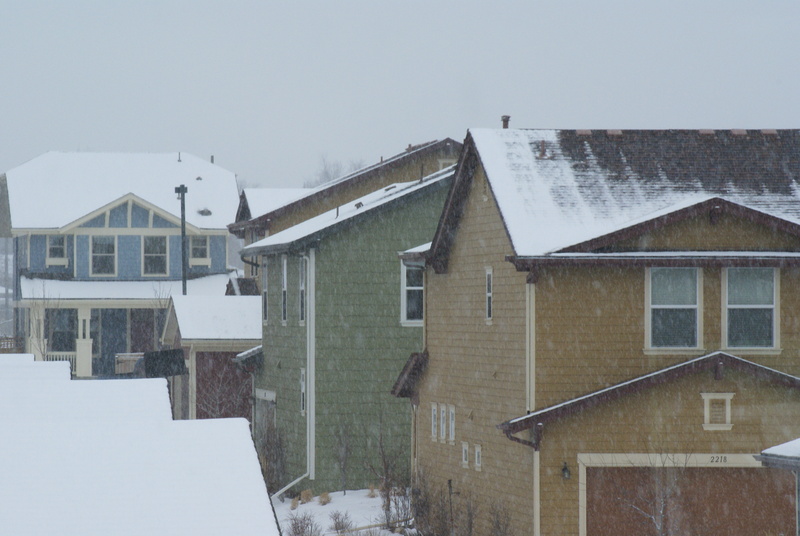 I took this picture on February 7, 2010, in Denver’s Stapleton New Urbanist development in Denver. Most of the houses in Stapleton are EnergyStar qualified, but this picture tells a story about some that aren’t. The blue house in the background was built in 2009 by Wonderland Homes. The tan house in the foreground is a KB Home built in 2008. Note how the still-falling snow is melting on the north-facing roof of the tan KB Home, but not on the similarly oriented roof of the blue Wonderland home. Also note that clear lines of unmelted snow where the roof trusses add an extra layer of insulation between the attic and the roof. This is a clear sign that the KB Home (NYSE:KBH) lacks sufficient attic insulation, and enough heat is escaping from inside the house to the attic to melt the snow on the roof as quickly as it is falling. Nor was it just this one house… all the houses I saw that were built by KB showed signs of snow melting on the roof, while all the houses I saw built by other builders (New Town Builders, Wonderland, and McStain) showed no signs of melting. Many were built in 2007, before either of the homes in the photo. I was shocked. The Stapleton website proudly proclaims “Since 2006, every Stapleton builder had been an EnergyStar partner.” I’d taken this to mean that every home built in Stapleton since 2006 was an EnergyStar home… an assumption I’m sure Forest City (NYSE:FCE-A) and KB Home would love us to assume. Instead, I have to assume it means that KB builds some EnergyStar homes, somewhere. From page 19 of KB Home’s2009 Sustainability Report [pdf]: We have a long history of building ENERGY STAR qualified homes. The percentage of our homes that are built to this exacting standard has grown from 1% of our home deliveries in 2001, the year we began working with ENERGY STAR for Homes, to 37% in 2008. One-third of our divisions built every one of their new homes to this standard in 2008, and only one of our divisions did not build at least some ENERGY STAR qualified homes. I’m underwhelmed. First, EnergyStar is not an “exacting standard.” An EnergyStar home must save at least 15% of the energy used by a standard code-built home. According to a 2008 National Renewable Energy Laboratory study [pdf p.14], “for a 2,000-gsf house built to achieve 30% energy savings relative to standard practice, a homeowner can save $512 a year more on his or her energy bills than the extra cost of the slightly larger mortgage.” In other words, this “exacting standard” leaves a lot of money on the table, even when the additional cost (and mortgage) is accounted for. Further, 37% EnergyStar qualified is better than your average homebuilder… but your average homebuilder does not plaster their website with the EnergyStar logo. I wonder if the owner of the tan house (or any of the many other KB Homes I saw with melting snow on the roofs) think they are living in EnergyStar homes?